Bicycle ‘Butterfly’ playing cards from RSVP Magic with original fairy-fantasy artwork by ‘Lotrék’, printed by USPCC, 2012. The court cards are depicted as human butterflies and the suits are colour-coded with two tones: light green or orange. The ‘butterfly’ theme is carried into the ace of spades, joker (not shown), box and back design. The deck is intended for magicians and cardists but is suitable for normal use as well. Lotrek has designed several decks which have been successfully funded on Kickstarter. 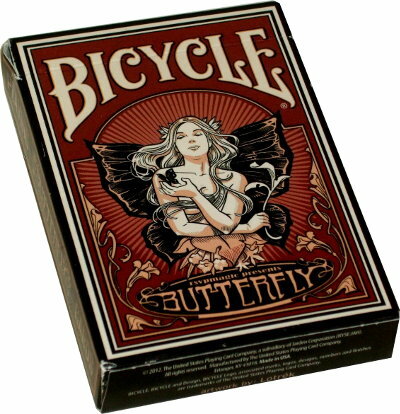 Above: Bicycle ‘Butterfly’ playing cards from RSVP Magic printed by USPCC with original artwork by Lotrék. 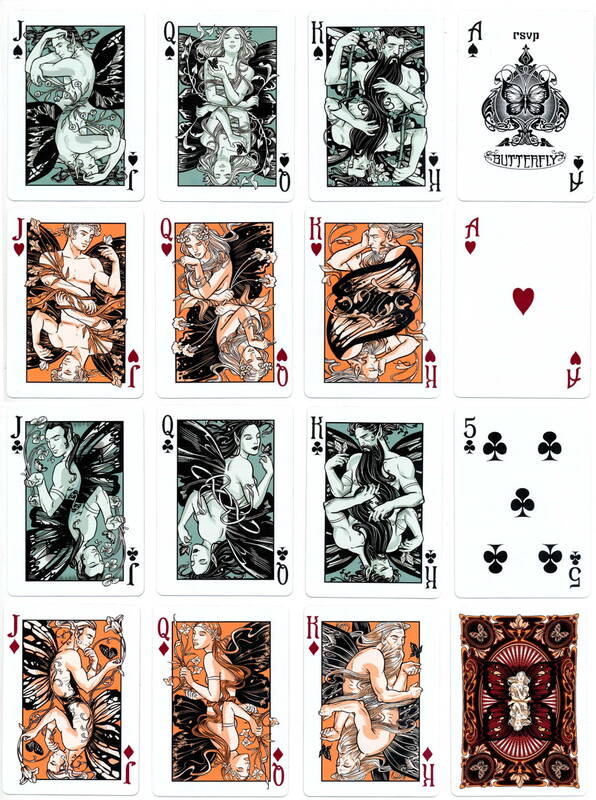 The deck contains 56 cards and includes two jokers, a double backer and one blank facer, allowing magicians to incorporate the deck into their routines. Images courtesy Matt Probert.